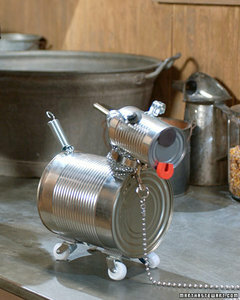 Making this tin can dog is a perfect project for you and your kids to do together. Almost everything you need can be found in your tool chest, kitchen cabinet, and recycling bin. Use a smooth-edge can opener to prevent any injuries, or rub jagged edges with emery paper prior to assembly. 1. Open one end of each can with a smooth-edge can opener. Use the larger can for the body, the smaller for the head. For the tail, drill two small holes near the open end of the large can; insert a bolt through the hole and fasten with a nut. Slide the extension spring over the bolt, and secure it through the second hole by hooking it from the inside out. 2. For the legs: Glue the wheels of the casters in place with adhesive, so they don't swivel; attach to the underside of the body with Velcro. 3. For the ears: Drill two holes halfway up the side of the small can, about 1 1/2 inches apart. Smooth the edges with the emery paper. Affix a cable strap at each hole using a bolt, a washer, and a wing nut, which is fastened inside the can. The bolts that secure the ears will be the eyes. Use a rubber washer over the aluminum one to give the dog a "spot" around one of the eyes. 4. Drill a hole in the small can opposite the eyes and a corresponding hole in the tail-side of the large can. Place a pipe clamp around a scouring pad to create a neck with a collar. Attach the head to the body with a long bolt and wing nut: Insert the bolt from inside the small can, through the scouring pad and clamp, and into the larger can; secure with the wing nut. 5. Use the flat magnet for the nose and the horseshoe for the tongue.